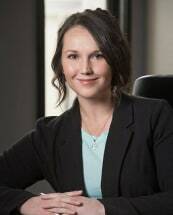 Prior to joining Burns & Hansen, P.A., Rachel served as a judicial extern in North Dakota’s Bankruptcy Court in Fargo, North Dakota, worked as a criminal law clerk at a small criminal defense firm, and served as a law clerk for Legal Services of North Dakota. In these positions, she became well versed in a variety of areas of law and legal skills including legal writing, research, and analysis of legal claims. Rachel is devoted to providing customized counseling and advocacy for all her clients throughout the stages of litigation. On every case, Rachel’s primary focus is to work with clients to achieve a positive outcome centered on the individual client’s needs and goals. In her spare time, Rachel enjoys spending time with family and friends, traveling, weightlifting, and cheering on her favorite professional sports teams, the Minnesota Vikings and the Chicago Cubs.